The dentist of this 12 year old boy noticed a slight bulging of the left side of the posterior mandible. 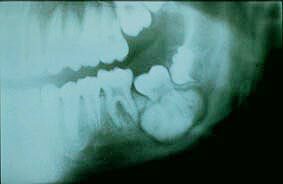 X-rays showed a well-demarcated, densely radiopaque mass obscuring the apices of tooth #18. A thin radiolucent perimeter to the lesion was also noted. 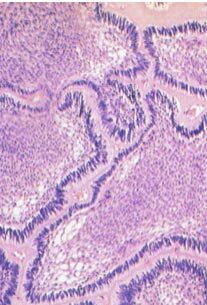 The most likely possibility in this case is a cementoblastoma since the lesion appears in continuity with the root apices. 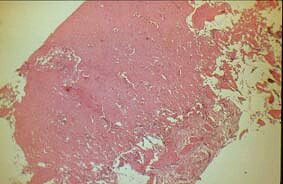 However, it is possible that an osteoblastoma might be superimposed over the apices. In this case, gross inspection of the lesion showed direct continuity with the tooth. Slide 1 (low power, H&E). 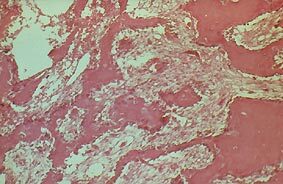 This slide shows dense sclerotic calcified material bordered by connective tissue. Slide 2 (medium power, H&E). There are variously shaped trabeculae surrounded by numerous cementoblasts. 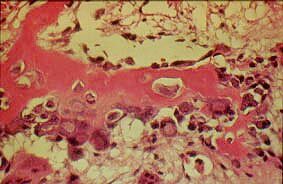 Many osteoclasts are also present. The stroma is loose and fairly well-vascularized. Slide 3 (high power, H&E). Note the large irregular cementoblasts with bizarre nuclei. However, these cells lack mitotic activity.